Last weeks Blog Hop was educational . . . I want to tweak a few things we have planned. A few years ago over here I updated our school room. It works so well for us. The BRIGHT LIGHTS and HUGE work space lets us spread out and dig into what ever we are studding. Below is a picture of what our school table looks like in the school room this year. One NEW thing we started at the end of last year is a binder for each subject. Each girl has their own shelf and their own color notebooks. Not pictures is the area when you first walk into the room. Last school year we had a piano in the space. We have moved the piano into the next room and now have a sewing work station set up. Both girls are spending time learning how to sew. A BIG thank you to everyone over at Heart of the Matter for hosting this event. You can visit more school room tours this week here. Oh, I love all those binders! And a different color for each student is a great idea. I'll have to remember that when mine get a little older. I love that idea of different colored binders! Very smart. Have a great week! You have a beautiful room! 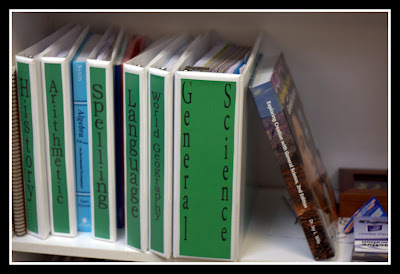 Love the color-coded binders! What a great room! We use notebooks for each subject, too. It's so much easier to keep papers organized that way. Thanks for the tour! You've got a great room! Love all those bookshelves! We do notebooks, too! I must admit, though, I sometimes get behind in filing it all away! 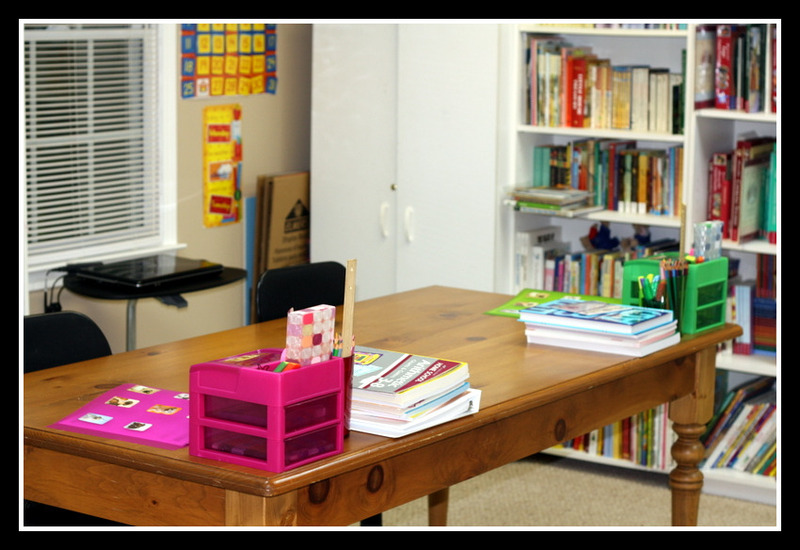 Hopefully, this year will be better now that I finally have a schoolroom. Hope you have a blessed year! Wonderful room. Love the organization that you have with the binders! I like how the girls each have their own colored binders. I also like the large, natural wood table. What is "Personal Help for Girls"? I have a 9 year-old and I that noticed you are using something different for her. What sort of girl issues does it cover and what age is it for? Thank you. Awesome school room!!! Looks so neat and organized too! Oooh, very organized. Looks great! Nice room! I also like the binder system! I like the idea of having a sewing station set up right there where you're spending the biggest part of your day. A lovely space! 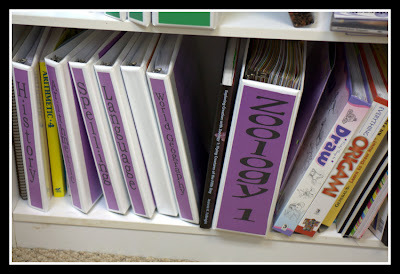 I especially like how the binders are color-coded; I do something similar for my girls. Hope you can stop by my place (#40 on this week's list): http://tinahollenbeck.blogspot.com/2010/08/not-back-to-school-blog-hop-school-room.html. What a great room! it's so big and bright! I love your binder system, too. I hope your school year is wonderful! Love your binder system, great room! You are so organized. I love the colors. Thanks for the nice comments on my blog! I love your big table and your color coded binders are genius. Have a great year! A great space you have. I like the binder organization, I do color-coded binders for my girls too. Have a great year! Looks great. We're hoping to work more on sewing this year, too! So bright and well organized. I love the big desk too. Thanks for sharing! Thanks for stopping by my blog! Have a wonderful school year! LOVE the spines on the notebooks! That must make it so easy to find each kid's things. Blessings on your school year. Looks great! Very neat and organized school room. Your blog is very cute. Love the three chicks! Love the classroom, especially the big table. BTW, are you still on FB? I have not heard from you in awhile. How are you? Thank you for commenting on my blog! I love your space--so organized! ;0) Happy Homeschooling! I LOVE the idea of the colored binders! That is awesome. Silly me, I've always thought in terms of buying binders that were colored and then they don't like that color anymore... Great idea! Your table looks so big and spacious, great work area! Looks beautiful! And very efficient. Great point about the bright lights in your work space~ I need to put that on my To-Do list. Thanks for sharing with us! 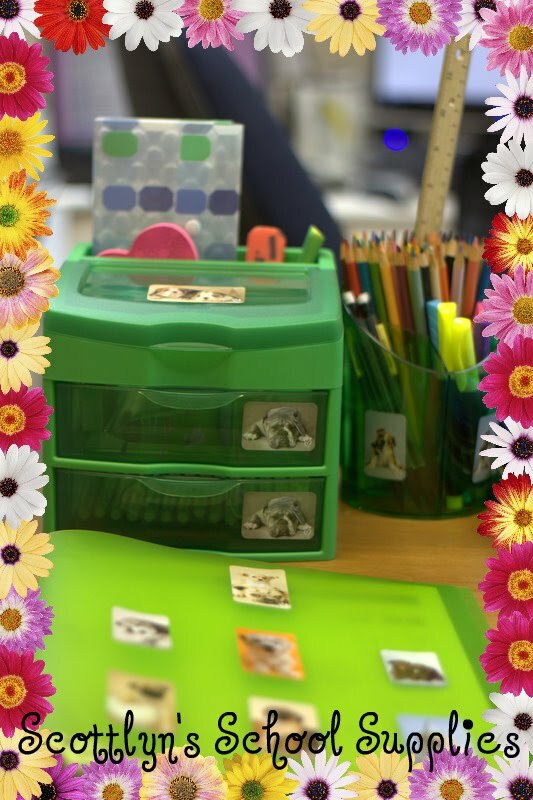 Love how your room looks and all your colorful organization! I love that table. The room looks great! Grab My Button . . .
She is Just Too Cute! !